Protect databases and sensitive data stored in Microsoft Excel. Secure financial/operational models developed in Microsoft Excel. Prevent employees from compromising company data and sensitive information. Control access and use of Excel spreadsheets. Secure data when files are stolen, lost or transmitted to other computers. Thanks to the innovative security system of Protection Security for Excel, the contents of your files can only be viewed on your own computer. Your Microsoft Excel spreadsheets will remain protected when your files get stolen, lost or transmitted to other computers. The security of Protection Security for Excel files cannot be compromised by password recovery software or other third party tools. This is achieved through Protection Security for Excel's advanced encryption platform. The contents of your files are automatically encrypted using the strongest cryptographic provider at 128-bit. 3. by simply using an encrypted password. With Protection Security for Excel, you can easily maintain the design of your spreadsheets and protect it from accidental or intentional changes. 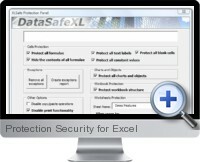 Protection Security for Excel offers advanced tools to easily protect any aspect of your spreadsheets. You can protect/ hide the contents of cells containing formulas, text labels and constant values with a click of a button. You can also easily specify input cells and leave them unprotected based on their cell color. Hardware activation With the Protection Security for Excel hardware activation system you can create licenses for your spreadsheets and control the number of users who will have access to your files. You can choose to have an expiration date and/ or trial period after activation of your files. After the expiry period has passed, users will not be able to access the contents of your spreadsheets. All Protection Security for Excel's features can be accessed via a user-friendly interface. Protection Security for Excel spreadsheets do not require any installation wizards or run-time files and can be easily distributed to their intended users as stand-alone files.